Stalin’s industrialization was planned as a series of five-year programs for industrial expansion. 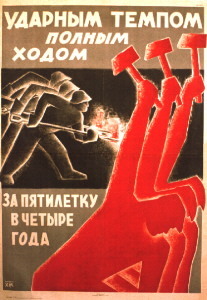 A five-year plan became the “law” of the life of Soviet society. The transition to centralized directive planning led to the revival of certain characteristics of the war communism era. It entailed the elevation of the role of the Gosplan—the state planning authority—that had been in existence since the early 1920s. Gosplan was directly subordinated to the government and charged with drawing up the five-year-plans in accordance with the leadership’s political objectives. The plans set targets of output and production to be reached ranging across the whole of Soviet industry. The First Five-Year Plan covered the period from October 1928 to December 1932. It was launched with great fanfare in an atmosphere of officially sponsored optimism. The first apparent successes pushed the leaders to adopt the slogan “The five-year plan in four years!” But soon numerous difficulties began to crop up. The industrialization was embarked upon too hastily, with insufficient resources and with a limited pool of skilled labor. It was severely handicapped by the country’s general backwardness in technological and economic terms and in social and cultural development. Moreover, overcentralized planning did not always work in practice. Untrained workers often could not operate the complicated, largely imported machinery, which was frequently put in unsuitable locations. At the end of 1932, it was officially announced that the overall objectives of the First Five-Year Plan had been achieved ahead of time. Even now, after seven decades, it is difficult to judge to what extent the triumphant declaration corresponded to reality. The newspapers were allowed to report only “outstanding achievements” of the USSR’s advance toward socialism. Local state agencies were prohibited from publishing any economic data apart from the official figures issued by the Gosplan. According to these, the output of machinery and electric equipment expanded by 157 percent over the 1929 level. Whatever the veracity of the Soviet statistics, in the industrial field the overall achievements of the plan were impressive. Two new important industrial centers were established, one in the Urals (Magnitogorsk) and the other in southern Siberia (Kuznetsk). Entirely new branches of industry were developed, such as aviation, plastics, and synthetic rubber. The plan constituted an important milestone in the process of the socioeconomic transformation of Russia.